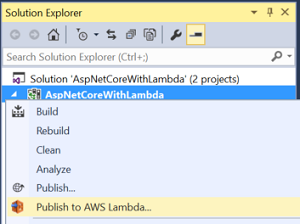 One of the coolest things we demoed at our recent AWS re:Invent talk about .NET Core support for AWS Lambda was how to run an ASP.NET Core Web API with Lambda. We did this with the NuGet package Amazon.Lambda.AspNetCoreServer (which is currently in preview) and Amazon API Gateway. 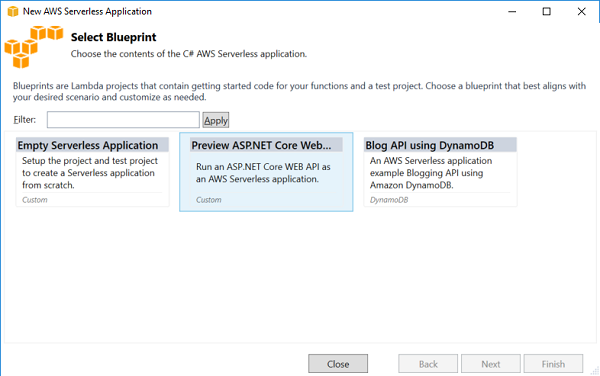 Today we’ve released a new AWS Serverless blueprint that you’ll see in Visual Studio or with our Yeoman generator that makes it easy to set up an ASP.NET Core Web API project as a Lambda project. Depending on your platform, a typically deployed ASP.NET Core application is fronted by either IIS or NGINX, which forwards requests to the ASP.NET Core web server named Kestrel. Kestrel marshals the request into the ASP.NET Core hosting framework. When running an ASP.NET Core application as an AWS Serverless application, IIS is replaced with API Gateway and Kestrel is replaced with a Lambda function contained in the Amazon.Lambda.AspNetCoreServer package which marshals the request into the ASP.NET Core hosting framework. The blueprint creates a project that’s very similar to the one you would get if you selected the .NET Core ASP.NET Core Web Application and chose the Web API template. The key difference is instead of having a Program.cs file that contains a Main function bootstrapping the ASP.NET Core framework, the blueprint has LambdaEntryPoint.cs that bootstraps the ASP.NET Core framework. The actual Lambda function comes from the base class. The function handler for the Lambda function is set in the AWS CloudFormation template named serverless.template, which will be in the format <assembly-name>::<namespace>.LambdaEntryPoint::FunctionHandlerAsync. The blueprint also has LocalEntryPoint.cs that works in the same way as the original Program.cs file, enabling you to run and develop your application locally and then deploy it to Lambda. The remainder of the project’s files are the usual ones you would find in an ASP.NET Core application. The blueprint contains two Web API controllers. The first is the example ValuesController, which is found in the starter ASP.NET Core Web API project. The other controller is S3ProxyController, which demonstrates how to use HTTP GET, PUT, and DELETE requests to a controller and uses the AWS SDK for .NET to make the calls to an Amazon S3 bucket. The name of the S3 bucket to use is obtained from the Configuration object, which means you can set the bucket in the appsettings.json file for local development. The Configuration object is built by using environment variables. When the application is deployed, serverless.template is used to create the bucket and then pass the bucket’s name to the Lambda function as an environment variable. ASP.NET Core introduced a new logging framework. To help integrate with the logging framework, we’ve also released the NuGet package Amazon.Lambda.Logging.AspNetCore. This logging provider allows any code that uses the ILogger interface to record log messages to the associated Amazon CloudWatch log group for the Lambda function. When used outside of a Lambda function, the log messages are written to the console. The blueprint enables the provider in Startup.cs, where other services are configured. This following snippet shows the call GetLambdaLoggerOptions from the Configuration object, which grabs the configuration of what messages to write to CloudWatch Logs. The appsettings.json file in the blueprint configures logging so that messages coming from classes under the Microsoft namespace are written if they’re informational level and above. For all other log messages, write debug level messages and above. For more information about this package, see the GitHub repository. Deploying the ASP.NET Core Web API works exactly as we showed you in the previous post about the AWS Serverless projects. Once deployed, a single Lambda function and an API Gateway REST API are configured to send all requests to the Lambda function. Then the Lambda function uses the ASP.NET Core framework to route to the correct Web API controller. You can test the deployment by accessing the two controllers using the AWS Serverless URL found in the CloudFormation stack view. <aws-serverless-url>/api/s3proxy – S3 Proxy controller. We’re very excited about running ASP.NET Core applications on AWS Lambda. As you can imagine, the option of running the ASP.NET Core framework on top of Lambda opens lots of possibilities. The Amazon.Lambda.AspNetCoreServer package is in preview while we explore those possibilities. I highly encourage .NET developers to check out this blueprint and the Amazon.Lambda.AspNetCoreServer package and let us know on our GitHub repository or our new Gitter channel what you think and how we can continue to improve the library. This entry was posted in C#, Problem solving, Programming, Software architecture. Bookmark the permalink.